EnLyte is a prescription folate-containing product for the clinical dietary management of depression related to low folate levels. It doesn't carry many of the side effects of other prescription choices used in depression, according to JayMac Pharmaceuticals, LLC. About 10% of Americans suffer from depression, and for many, a prescription drug is the answer. Unfortunately, most come with too many side effects – from weight gain to suicidal thoughts. Folate replacement therapy is a proven, natural alternative, and EnLyte is the newest and most complete addition to this market. The American Psychiatric Association recommends folate therapy as a safe, low-cost option with a favorable side effect profile, as does their Task Force on Complementary and Alternative Medicine. 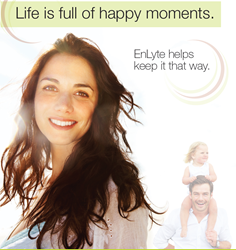 Introduced in 2011 by JayMac Pharmaceuticals, EnLyte gets excellent feedback from both doctors and patients. It addresses all of the most common genetic mutations affecting depression, like MTHFR, with a comfortable side effect profile. Joe Schatz, Board Certified Family Psychiatric/Mental Health Nurse Practitioner and Clinical Faculty of The University of Pennsylvania in Philadelphia, PA states, "I have found EnLyte to be an important tool in helping my patients with MTHFR polymorphisms. 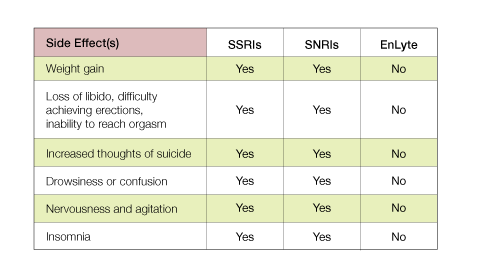 More exciting, though, is that the improvement in the symptoms of depression is validating for the patient. The improvement is associated with relief for many individuals as they realize 'It wasn't my fault that all of the medications I've tried weren't working the way they were supposed to work.'" EnLyte treats depression naturally, with no worries about weight gain, sexual dysfunction, suicidal thoughts, or the other bothersome side effects that come in the usual antidepressant "package deal." According to Dr. Andrew Farah, MD, who runs a thriving psychiatric office in North Carolina, and is Chief of Psychiatry of UNC/High Point Health Systems, "About 60% of people don't finish their antidepressant therapy because they don't like the side effects." Nutraceuticals are becoming more popular as many are looking for natural alternatives to serious conditions; Matt Rosenberg, MD, Mid-Michigan Health Centers: "A nutrient approach to depression offers the advantage of a lower side-effect profile." But not all products in this area are created equal. EnLyte is regulated by the FDA, and has an NDC #, so you can be confident each ingredient has been scrutinized, which is not the case with all folate products. EnLyte contains Delta Folate and is so safe it's pregnancy category A. To learn more about this natural, safe approach to depression, visit http://www.EnLyteRx.Com and speak to your healthcare provider.